The famous Roman philosopher Marcus Tullius Cicero once said, “If you have a garden and a library, you have everything you need.” That’s because while a library can feed your mind, nature can feed your soul. 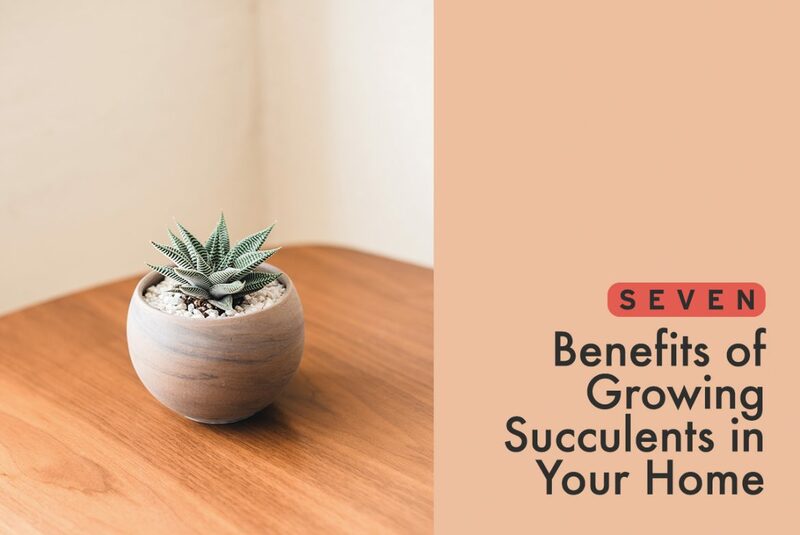 You can bring a part of nature into your home by introducing easy-to-raise succulent houseplants. Succulents make such popular houseplants because of their hardiness and ability to grow in a wide variety of climates. In nature, one can find these plants growing in virtually any clime: from seaside cliffs and humid jungles to bone-dry deserts and frigid mountains. In homes, they thrive in room temperature environments. They will not only add green to your living space any time of the year, but they will also bloom in season, thereby splashing the canvas of your home with color. The article “Plants Clean Air and Water for Indoor Environments” describes NASA research using plants in a BioHome. This research suggests that succulents can remove many volatile organic compounds (VOCs) from the air. Plants emit water vapor, and that in turn generates a pumping action that pulls contaminated air down to the roots of the plant. The succulent converts these contaminates to plant food, thereby purifying the air of your home. Unlike most plants, succulents do not release carbon dioxide at night. Instead, they continue to produce oxygen. This continuous burst of oxygen freshens the air in your house and improves your breathing – assuming, of course, you aren’t allergic to the plants. It’s a good idea to position plants in rooms where you feel you need an extra breath of fresh air, such as the bathrooms or even your kitchen. The Centers for Disease Control and Prevention (CDC) reports that 11 percent of American children have ADHD. Many adults and children also have less severe issues with attention. But as Richard Louv describes in his 2005 book Last Child in the Woods, which introduced the concept of Nature Deficit Disorder, regular exposure to nature – even in the form of houseplants – can help children to focus better. It may sound preposterous to suggest that the mere presence of a plant can curb your pain, but the idea has gained some support from horticultural therapy research conducted by the University of Kansas. This research found that patients seemed to need less pain medication when they had plants in their hospital rooms. Psychology research conducted by the University of Michigan reveals many cognitive benefits to interacting with nature, whether that means walking in a park, growing plants in your house, or even just looking at photographs of flora. In fact, memory retention was shown to improve as much as twenty percent after subjects spent an hour in nature. Improved memory retention leads to enhanced work and school performance, so it’s a great idea to place succulents in your study or library, your home office, or in any room where your children typically do their homework.